Devon is one of the “go-to” spots for surfing in the UK. With coastline that directly faces the Atlantic Ocean on its northern edge and gentler swell from the Channel on its southern coast, Devon has something for every age and ability, from the first timers to the big wave pros. Why is Devon so Good for Surfing? The first reason Devon is so renowned for good surfing is variety. With hundreds of miles of surfable coastline, the county has so many different conditions everyone can find their perfect spot. There are tiny hidden coves that swell only when the conditions are perfect, long beaches with amazing rollers most days, and everything in between. 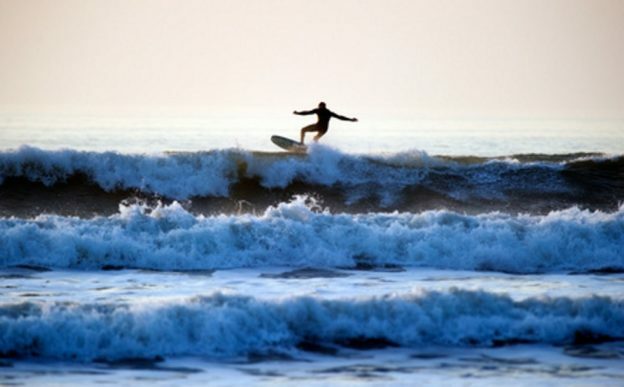 The second reason Devon is so fantastic for surfing is the local’s passion for it. Although some beaches like Saunton Sands and Woolacombe can get crowded in summer, the locals are hitting the swell year-round and have made tight-knit and welcoming communities up and down the coast. Everyone is looking for the best swell, so when the word gets out of a break, they just pile in and go! Finally, Devon’s internationally renowned surf schools make it one of the best places to learn to surf in the UK. The swell from the Atlantic is pretty consistent in many places and here you will find the surf to learn. Rock up and introduce yourself or book ahead, it’s all good. One of the really cool things about surfing in Devon is that there are so many great beaches to hit on both the north and south coasts. You can fit a few surfing sessions into any packed holiday itinerary. The beaches you’ll enjoy surfing on are the same ones the non-surfers you might be travelling with will enjoy too. It’s all good! One of the best spots in the UK for catching great, consistent swell, Bideford Bay faces west into the Atlantic Ocean, so the great big rollers cruise straight in and crash straight onto the beach. Following a big storm or hurricane in the USA, it’s one of the spots that gets the best of the remnants propelled north by the Gulf Stream. The North Devon Surf School is located at Bideford, so you can get expert tutelage right where the surf is good. It’s a wide bay that has swell most days that is suitable for learners. The Atlantic swell comes up the channel and hits Bantham, giving it some excellent swell most days. The Bantham Surfing Academy is located here, so you can learn. It gets a bit packed in summer as it’s the most popular surf beach on the South Devonshire coast, but it’s still worth hitting up. 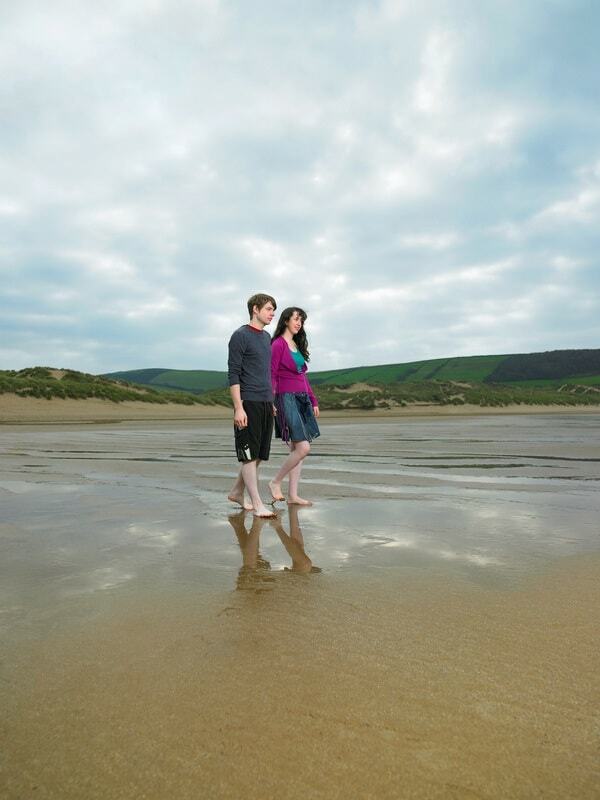 With miles and miles of beach, there’s always room to catch your wave on Woolacombe Beach. It’s a very popular spot for professionals and learners alike on the North Coast, and there’s a good school if you or the kids want to learn with the best. It is also very beautiful and perfect for those poor souls who do not love the wave. Putsborough is a spot that the locals know to hit when things get too gnarly elsewhere. During winter, you’ll find the locals paddling out here: it is sheltered from the worst of the Atlantic and delivers good swell when everywhere else is blown too big. For the longboarders and beginners, Saunton offers some of the best long wave rides on the Devonshire coast. It’s a perfect spot for beginners who are getting the basics right. The swell is steady and you can get some good practice in on the long waves. The Surf Saunton school is very good too. On the western limit of the Bristol Channel, Croyde picks up a lot of swell right off the Atlantic and is one of the go-to spots for the big boys and learners alike. It can get big out there! Plus, it’s an Area of Outstanding Natural beauty, so everyone’s happy. Nearly every beach on the Devonshire coasts have coastguards during the summer months. However, they are not always there, so make sure you have checked before you go. There are few places better to learn to surf than Devon, so check out the schools that dot the coast. Prices are very reasonable and the quality of teaching is very high. The International Surfing Association badge is something to look for: it is a guarantee of quality. Lessons are worth paying for, they can halve the time it takes to get paddling out and riding in and keep you safe at the same time. There are a number of webcams and surf reports for Devon you can check out. They can be super-helpful when planning a trip. This entry was posted in Things To Do In Devon and tagged surfing on June 1, 2018 by admin.